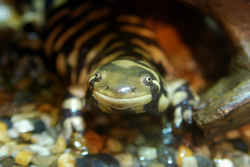 Illinois citizens voted to select the eastern tiger salamander as the state amphibian in 2004. On February 2, 2005, Representative Bob Biggins introduced House Bill No. 847 designating the Eastern Tiger Salamander as the official State amphibian of Illinois and designates the Painted Turtle as the official State reptile of Illinois. 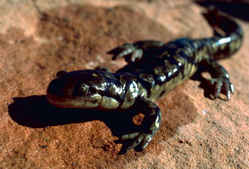 The eastern tiger salamander was made the official state amphibian of the State of Georgia when Governor Rod Blagojevich signed House Bill No. 847 on July 19, 2005. In 2004 Illinoisans agreed and I made the list. I live in forests, pastures, orchards and prairies as well as parking lots and even housing developments as long as water is nearby. I have a big cat name but a cat I am not. Who am I? Then Lt. Gov. Pat Quinn and Rep. Bob Biggins (R-Elmhurst) teamed up in 2004 with Brookfield Zoo and the Chicago Herpatological Society to sponsor this first-ever virtual election for an official state symbol. Six students from Jackson Middle School in Villa Park served as "campaign managers"for the amphibian and reptile candidates. Students and citizens across the state voted for their favorite amphibian and reptile. 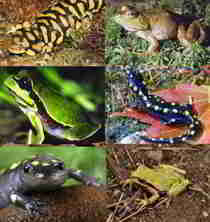 The amphibian candidates were the Gray Tree Frog, American Toad and Eastern Tiger Salamander. Reptile candidates were the Eastern Box Turtle, Common Garter Snake and Painted Turtle. With the virtual voting booths officially closed as of midnight Friday, December 31, 2004, Lieutenant Governor Pat Quinn announced the people's choice for official Illinois Amphibian is the Eastern Tiger Salamander and the official Illinois Reptile is the Painted Turtle. The tiger salamander is one of the largest terrestrial salamanders in the United States. The biggest specimen recorded was 13 inches long. The average size ranges between seven and eight inches. It is stocky with sturdy limbs and a long tail. The body color is dark brown, almost black, and irregularly marked with yellow to olive colored blotches. The only other salamander with which it might be confused is the smaller spotted salamander (Ambystoma maculatum). The spotted, however, has two rows of regular, yellow-to-orange spots running parallel down its back, as distinct from the irregularly distributed spots of the tiger salamander. The tiger salamander spends most of its life underground, as do other members of the group referred to as "mole salamanders." On Long Island, it emerges from its burrow in February or March to migrate at night, usually during rain, to the breeding ponds. After a brief courtship which consists of the male pushing his nose against the female's body, eggs are laid in a mass and attached to twigs and weed stems under water. The female may deposit one or more egg masses containing 25-50 eggs per mass. 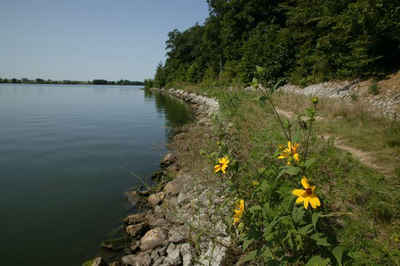 Hatching occurs after approximately four weeks and the larvae remain in the ponds until late July or early August. After this time, the larvae transform into air breathing sub-adults measuring between four and five inches, and leave the ponds at night during wet weather to begin their underground existence. It takes four to five years for the salamanders to reach sexual maturity and they may live for 12-15 years. The tiger salamander eats invertebrates and small vertebrates. By Act # 094-0257 of the Illinois General Assembly, the eastern tiger salamander amends the Illinois Compiled Statutes, Chapter 5, by adding Section 85. The following information was excerpted from the Illinois Compiled Statutes, Chapter 5. The word amphibian means two-lives. 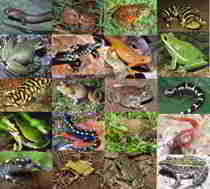 Amphibians spend their lives in the water and on land.